I've had an issue with Pilchard lately. She's been going into the basement to poop when she wants to register some discontent with the litter boxes. I never know, precisely, what that discontent is and the fact that I don't have to do laundry as often as I used to, thanks to Patt and Pam helping me out in May and June means I don't find the poop for many days. Over the weekend, I went into the basement to do a load of clothes and saw a dark line by the washer. You need to scrub the area where the cat pees or poops to remove the smell and I was irritated at having yet another spot to clean. I grabbed a paper towel and went to pick up the piece only to find out it wasn't poop. Viola. 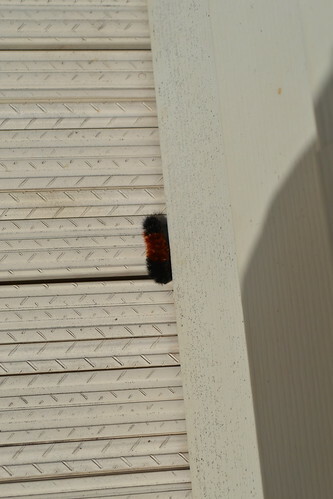 It was a wooly bear. I used to see these caterpillars in a lot of places this time of year. It wasn't uncommon to see 4-5 in a week. Now, it's rare to see even one in a year. I chanced across one in Wisconsin while doing an inspection. I was thrilled to see this one. Having one in my basement is very special. But he wasn't going to survive down there. So I took him outside and put him in the remnants of the pansies. It tickled when he crawled across my hand. It's interesting that the Wisconsin wooly bear's stripes are roughly the same width, while my wooly bear is distinctly more brown. Folklore would say that the Madison area, where I was doing inspections, is going to have a winter similar to last year while my house will have a mild winter. I've seen projections which say a warmer but snowier winter. Mild, I don't mind. Less heating costs. Snowier? Well, I'm on the fence about that. It would mean more shoveling, something my joints wouldn't appreciate. We'll just have to see. 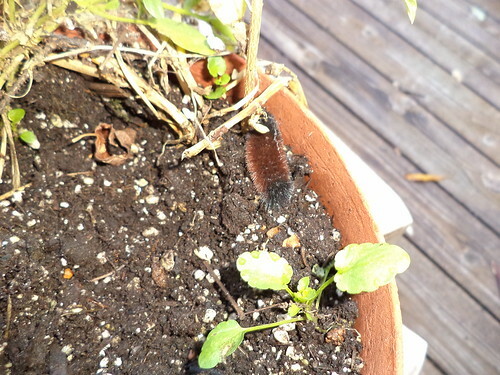 I wonder if the lack of wooly bears is akin to the lack of monarchs. I'm disappointed that, with all the milkweed I let grow in my yard, I don't have any chrysalises. You'd think, if they can find food, they'd leave their eggs. I try to provide an attractive ecosystem for moths and butterflies even if it makes the yard look unkempt.